The world-famous board game. You know what it’s about – you roll the dice, buy property, build hotels, and pay bail bonds to get out of jail. All that to drive your opponents into bankruptcy by becoming a monopolist and controlling the entire economy. 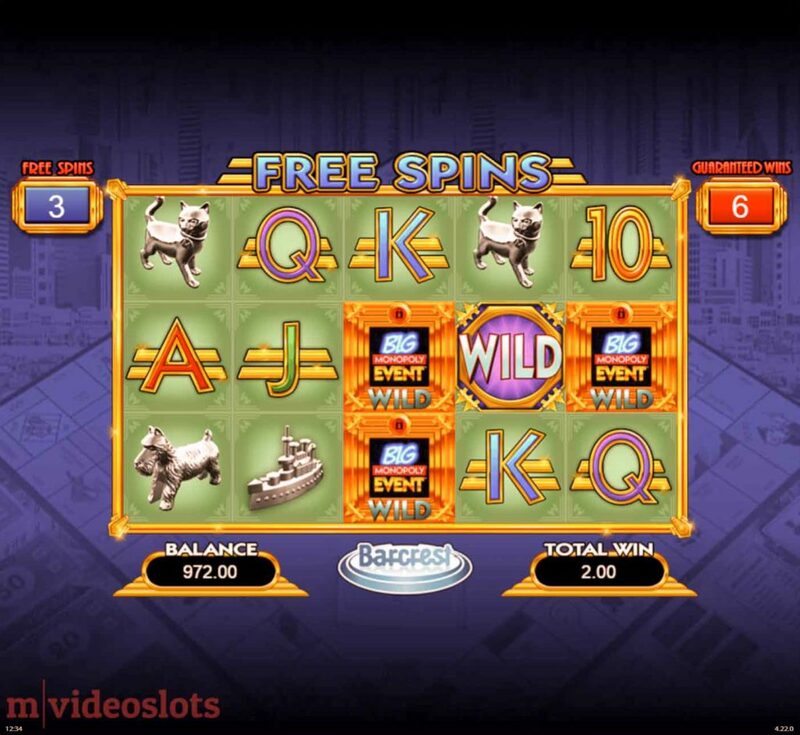 Now let’s talk about the Monopoly Big Event mobile slot by Barcrest. Running on Williams Interactive’s (WMS) platform, owned by SG Gaming, reviewed by me. Monopoly celebrated their 80th anniversary in 2015. Okay… you may know the board game, but how many Monopoly slots can you list? And how many of them are actually still in operation? Not many of them really. 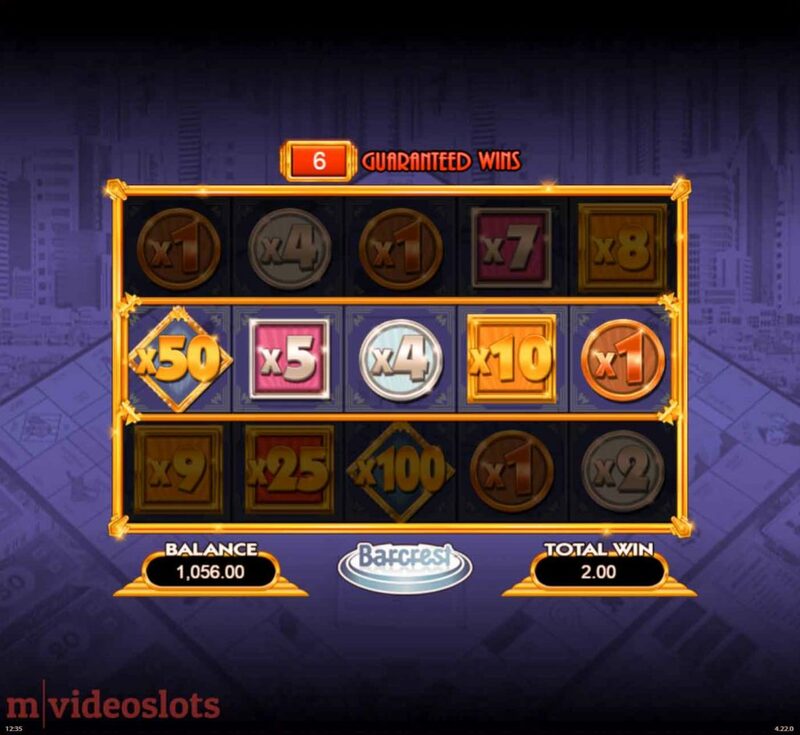 I know that you can play the Super Money and MegaJackpots episodes at Vera&John and bgo Vegas, but the rest may be gone – however only the former is mobile compatible. The Capitalist Board Game from Barcrest. 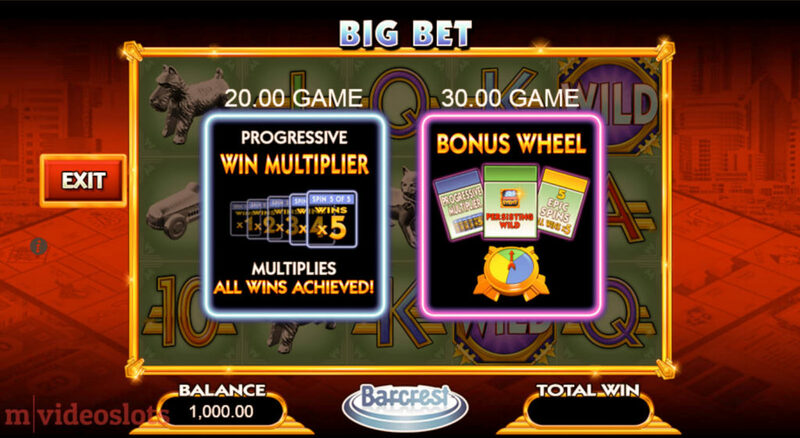 However, what you can confidently play on your mobile and tablet with sharp HD graphics is this Barcrest-powered 20-liner Monopoly Big Event, released in May 2015. What’s more, this is possibly one of the most interesting mobile video slots you’ll ever play, because these games have never been boring. So pay close attention, as there’s lots to come. 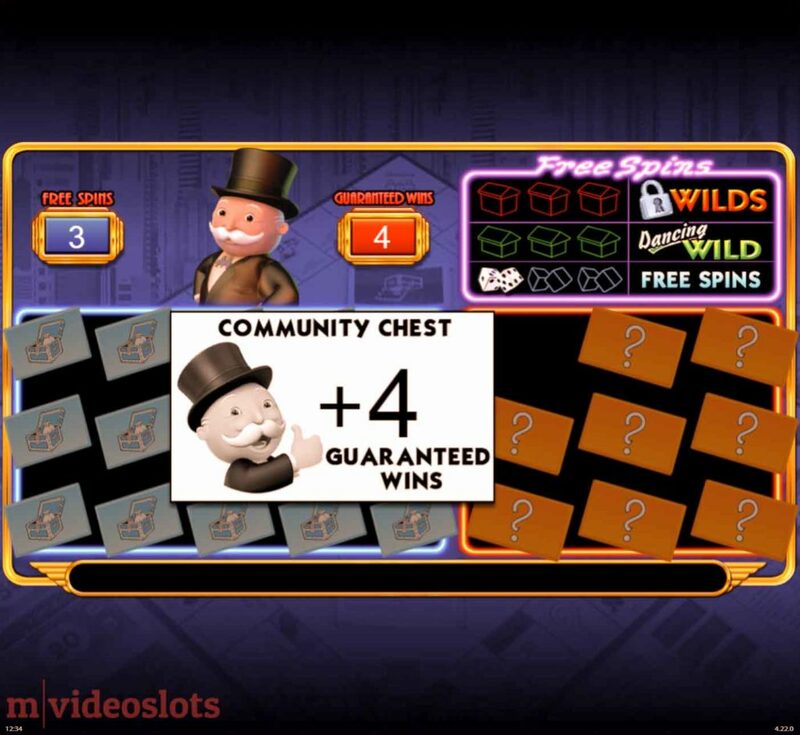 As you can see from the screeners, Monopoly Big Event mobile slot has the classic red, gold yellow, and money green colour scheme that dominates the game. There’s no fancy animations – it’s all kept pretty simple in the base game. And before I move on to the bonuses, you probably want to know more about the symbols. The Monopolist, or the Host of the game. As you can see from the image above, they award up to 300, 400, 500, 1,000 and 2,000 coins for five in view, respectively. There’s the standard Wild too, which substitutes all regular icons except for a couple of specials that I cover next. I haven’t covered the Big Bet feature yet. 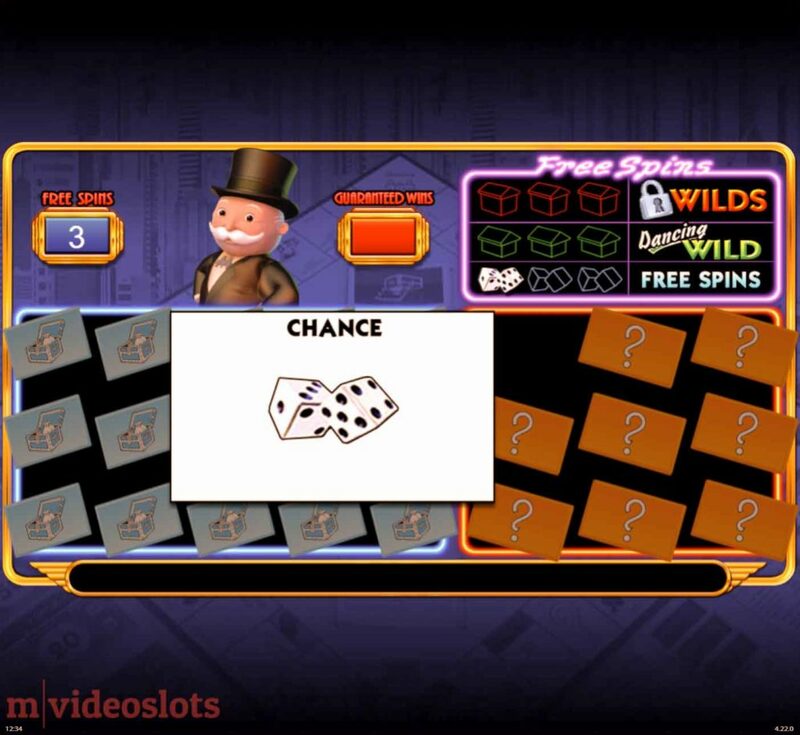 The one that you can also see in mobile video slots like Ohh Aah Dracula and Wild Knights and both of which can be found at the Vera&John casino in demo. a 30-credit game with Bonus Wheel. Those are pretty costly as you can see and they only last for 5 spins. That means each spin is worth 4 and 6 credits depending on your bonus choice. 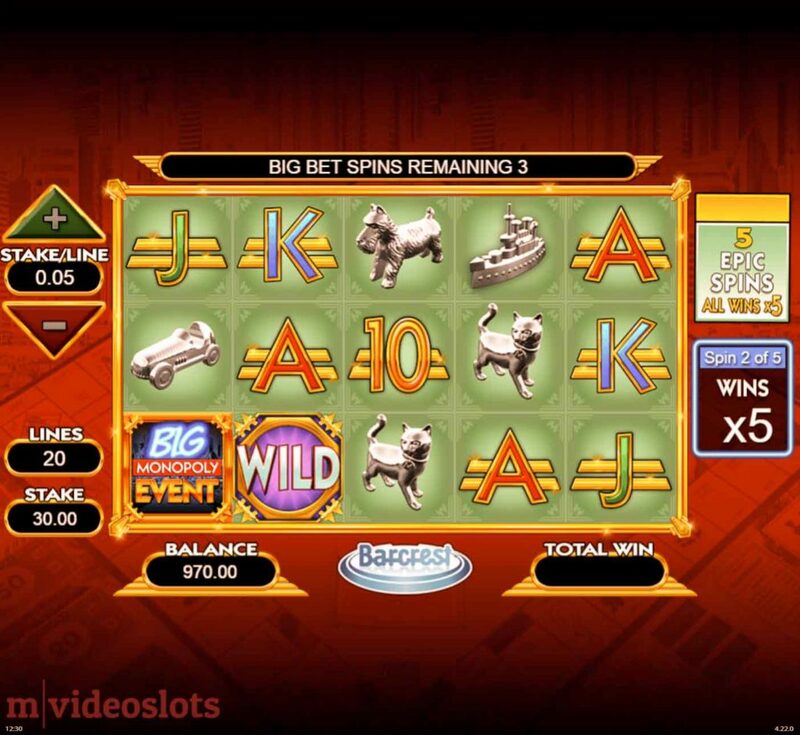 Go for the Big Bet spin to increase your chances of winning the Big Event Bonus! I’ve made a video for you so you can see how the bonus works, unless you want to play it yourself. It’s quite fun and can be very rewarding. What happens in this round (see image below) is the multiplier increases in increments of 1 after every spin, up to a maximum of 5 spins. As I already mentioned, this will cost you 4 credits per spin. This is the Progressive Win Multiplier bonus. This is a more expensive choice that can also bring more cash into your account quickly. This Big Bet option starts with a wheel spin. 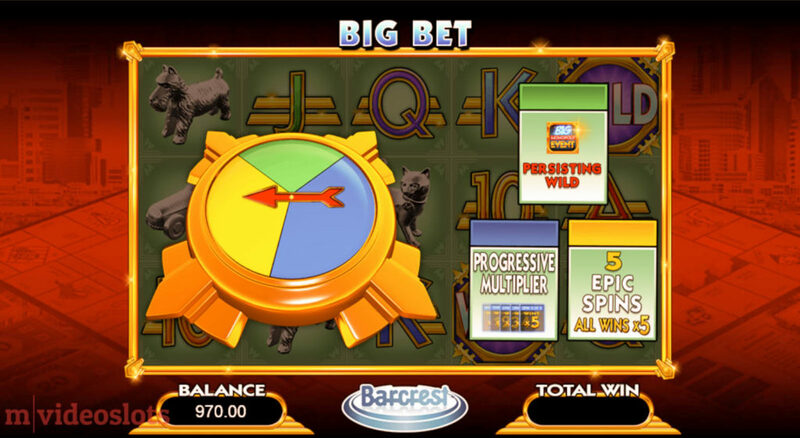 Depending on where the arrow stops, you can either win the Progressive Win Multiplier, Epic Spins, or the Persisting Wild Big Event. I covered the 1st option, now let’s review the other two. 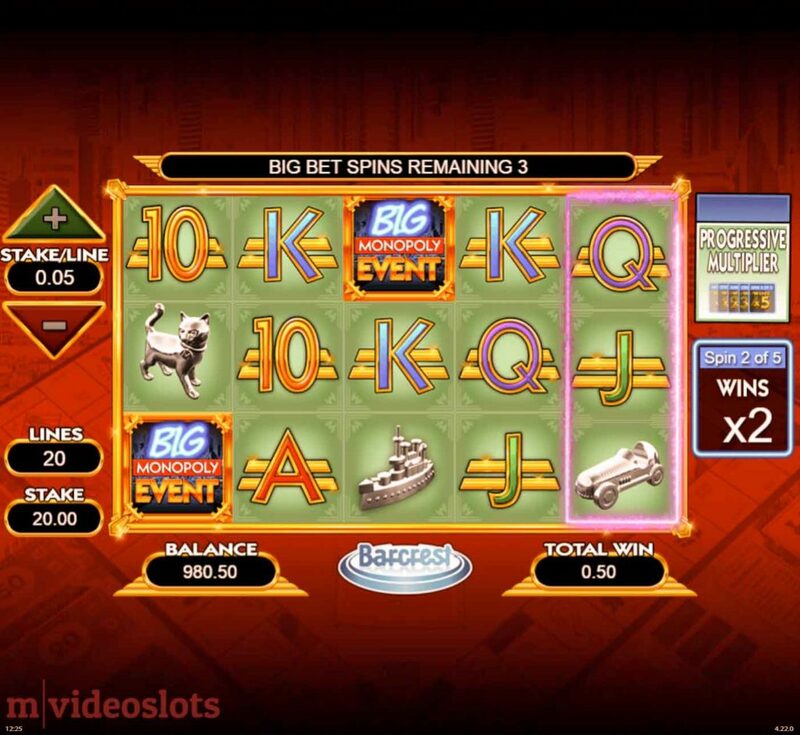 Big Bet game — Monopoly Big Event mobile slot. 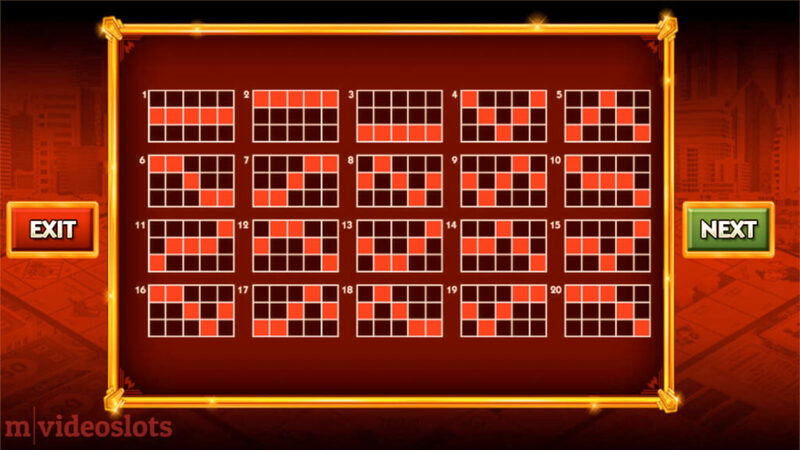 During the Epic Spins, a win multiplier of x5 is applied to each spin. 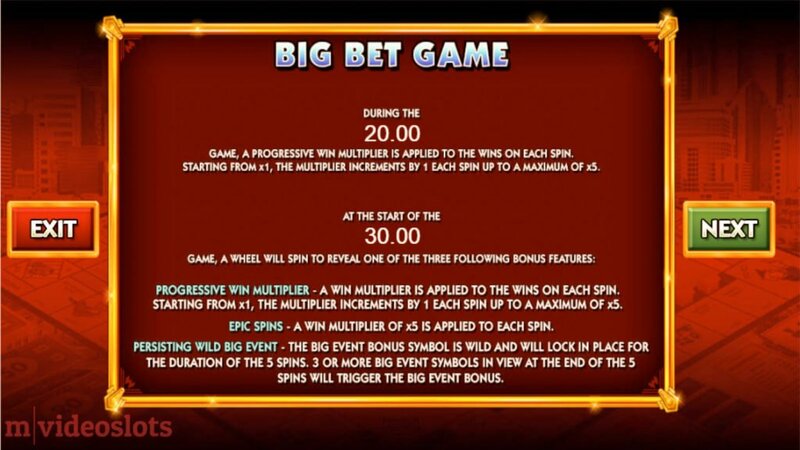 Epic Spins bonus — the multiplier is on the right. The Big Event Bonus symbol turns Wild and freezes for the duration of 5 spins when it comes up. 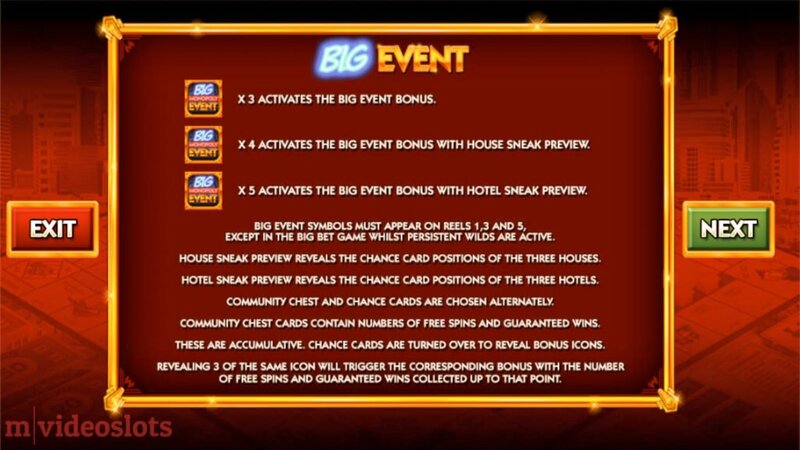 What’s more, you can win the Big Event Bonus for 3 or more Big Event Bonus symbols, which will start at the end of the feature. That’s why the wheel arrow is least likely to land on this feature to begin with. But before we get ahead of ourselves, there is another way to trigger the same feature. Choose your cards and win a bonus! You guessed it — you can trigger the coveted bonus with the Big Event symbols in the main game too! Keep an eye on the screen and hope that 3, 4 or 5 of them will hit at once — and the more you trigger the better it gets. This is actually a Free Spins bonus, but before you get to enjoy the spins, you’re allowed to choose both Chance and Community Chest Cards. Collect Chance cards to win Free Spins. Community Chests for Guaranteed Wins! So when you land 4x Big Event Bonus symbols on the screen in that pre-bonus round, you automatically win 3x Houses that activate Dancing Wilds. 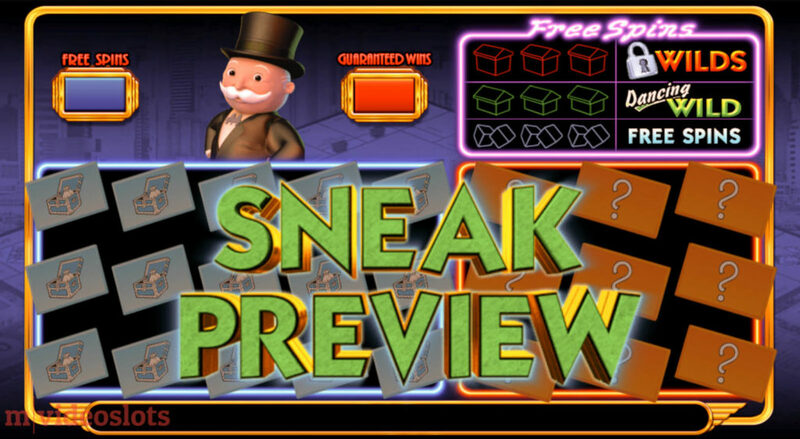 This is part of the Sneak Preview feature and when you trigger 5x Big Event Bonus symbols the game automatically reveals 3x Hotels that enable Locked Wilds. What are these special Wilds? During the freebies, a reel will be chosen at random to become Wild! 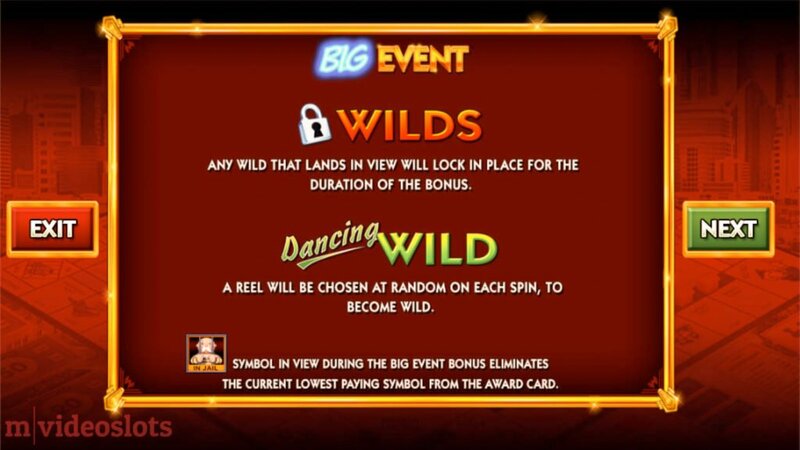 As you enjoy the spins, any Wild that lands in view will lock in place for the rest of the freebies! Did you know that there’s a best strategy on how to play the Big Event Bonus? In fact, during the Sneak Preview, if you pick two of the hinted House or Hotel symbols and then pick randomly for a symbol other than a House or Hotel, you increase your chances of winning more features! RTP percentage is 3% higher at best strategy. Then at the end you simply reveal the 3rd House or Hotel. 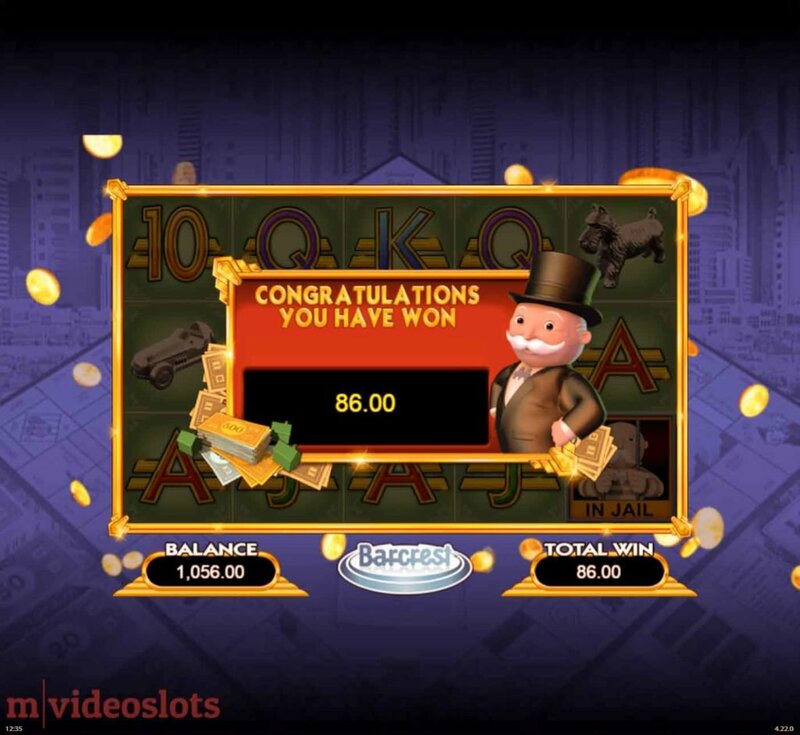 Believe it or not, there’s even more to the bonus, but before you forget it all, have a look at the Monopoly Big Event mobile slot video review that I made for you playing on my iPad. Well, it’s essentially because when they appear during the Big Event Free Spins, they eliminates the current lowest paying symbol from the award card. 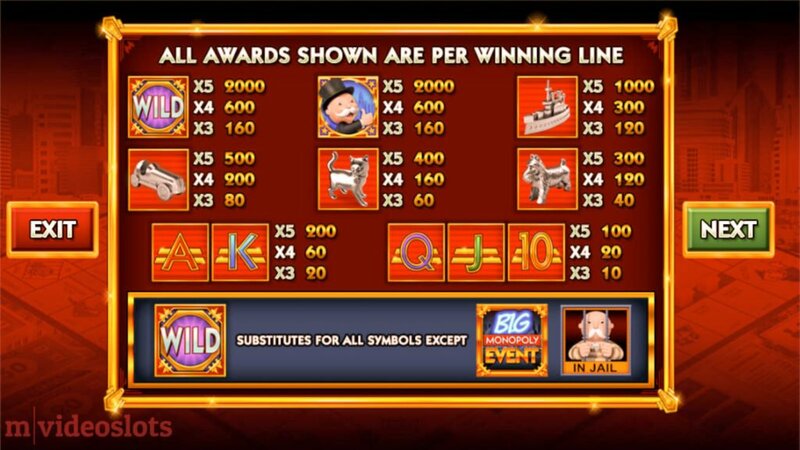 No more cheap symbols means better chances to win something BIG! Did I mention Guaranteed Wins? A separate set of reels will then appear with multipliers on them. Whatever number you land it will then be multiplied by one. 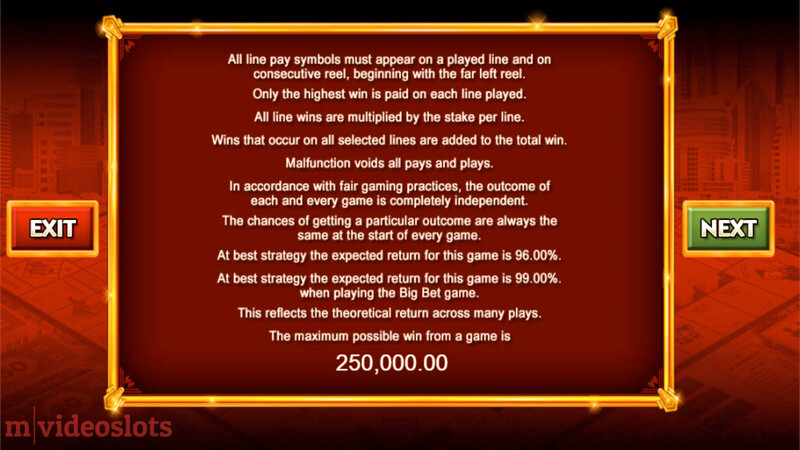 Guaranteed Wins multipliers in the Monopoly Big Even mobile slot. That’s not fair! — you might say, and I completely agree with you. A multiple of your actual total stake would be much better than one, unless your bet is lower than that. 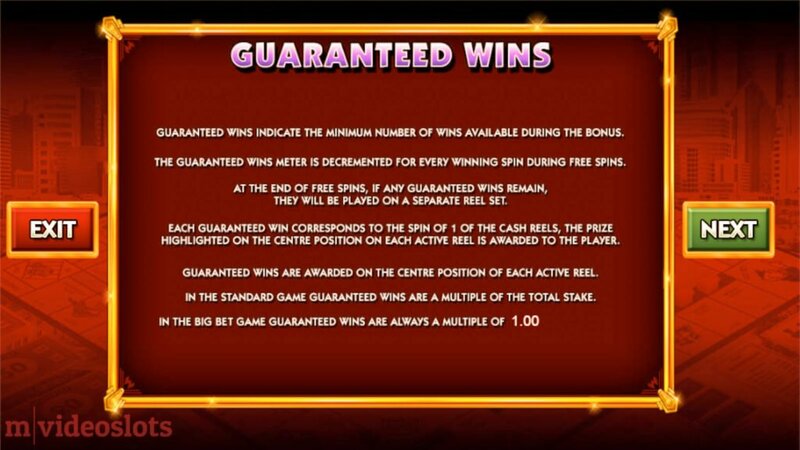 Free Spins bonus and the Guaranteed Wins counter on the right. Ironically, you won’t be able to become the ultimate winner playing the Monopoly Big Event slot, but you can still cash out some nice winnings from it. 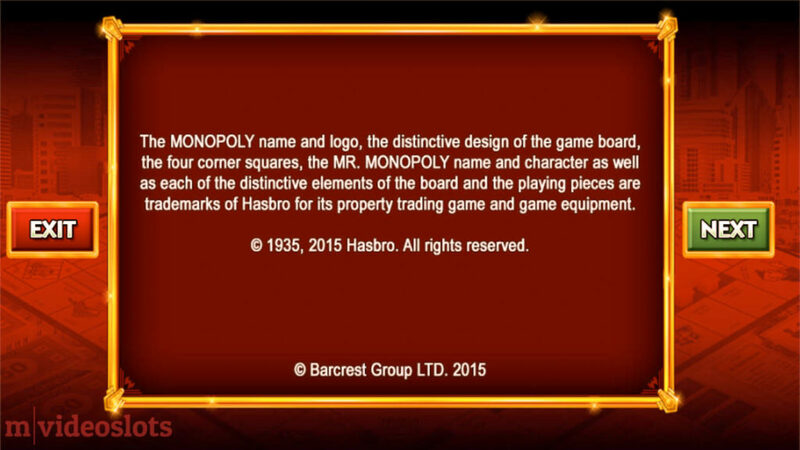 The game’s fun to play, and it’s imaginative and delivers Hasbro’s Monopoly image clearly no matter what device you play it on. Hopefully my review will help you make the right choice, but you’re more than welcome to try the game at one of the mobile casinos below. 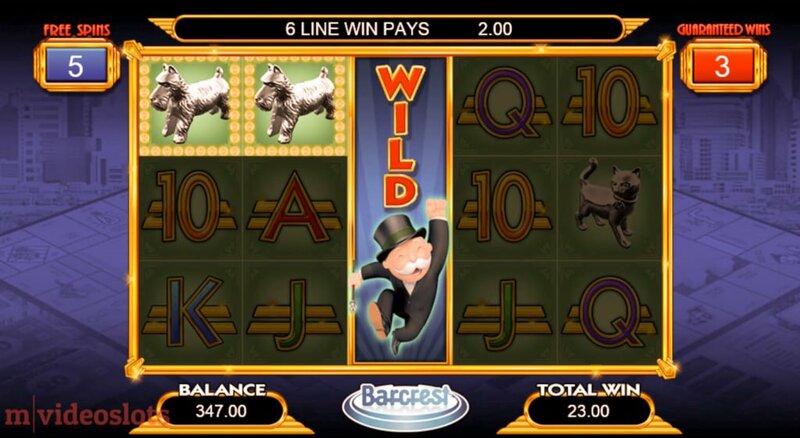 WMS has a few more mobile slots with 20 lines, including Rainbow Riches and Amazon Queen. Or is it the Guaranteed Wins feature that you’re after? Play’n GO has a 10-liner called Pimped with something like that too and it’s also money-themed, although has higher variance.